As part of the new direction of weebly I am in the upcoming season going to profile players who I believe will become stars of the game at both domestic and world level over the next few years. I am kicking this off with a player who hasn't really lived up to the price tag that his moved to his current club PSG demanded last summer, I give you JAVIER PASTORE. Pastore cost PSG an impressive €39.8m in the summer of 2011 from Italian side Palmero who he reportedly cost the €4.7 million from Hurican from in his native Argentina in 2009. 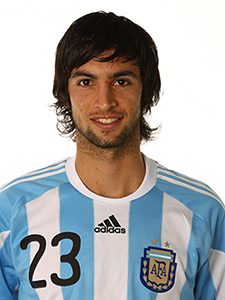 Pastore was born in the Argentinean city of Cordoba in 1989 it wasn't until 2007 - 08 season while playing for Talleres that he started to show some promise of the things to come from the youngester. Pastore was intially loaned out to Hurican where he went on to make his league debut in the 1-0 defeat to river plate in May 2008. It wasn't until 2009 under Hurican manager Angel Cappa that he established himself in the Argentinean game finishing that season with 8 goals in 31 games including a belter in the game against River in a 4 - 0 nil win, Huricans biggest win in over 40 years against River. On July 11 2009 Italian side Palmero announced they had signed Pastore form Hurican on a reported 5 year deal, ending speculation that a whole host of top European clubs (man utd, porto, ac milan & chelsea) were ready to sign the player. On August 15th in a Coppa Italia tie the Argentine finally made his debut but it wasn't until Ocotber that Pastore made an inpact assisting Edison Cavani in a 2 - 0 win aaginst Juventus. He's scored his 1st goal in Serie A goal in January 2010 in the 4 - 2 defeat away at Bari. the 2009 - 10 ended with Pastore only managing to prove himself as a promising youngster after only really impressing when coming off the bench for Palmero although 2010 did see Pastore make his offical full international debut when his played for Argentina against Canada on May 25th and later that summer Pastore can off the bench against Greece in the 2010 world cup in South Africa replacing Sergio Aguero in the 2 - 0 win. 2010 also finished with Pastore winning the Young Italian player of 2010. Under new manager Rossi the 2010 - 11 season Pastore really made an impact showing some form and consistancey required to really make an impact on the world game, Pastore took up a new role behind Palmero's front two of Cavani & Micoli resulting in Palmero finishing the season with a 5th place finish and qualification for the Europa league. On 26th August French side PSG formally announced the signing of Pastore for €39.8m , although Palmero's official website stated they only received €22..8m for Pastore with €12.5m going to Pastore's agent Marcelo Simonian. Pastore scored his 1st league goal in September against Stade Brest in the 1 - 0 win although PSG failed to win the league. 2012 - 13 is shaping to be become an interesting season for Pastore & PSG under new manager Carlo Ancelotti they have shelled out on some of Europe's best players like Thiago Silva, Zlatan Ibrahimovic & Ezequiel Lavezzi it promises to be an interseting season in the French Capital so time will tell if the young Argentinean really will be a Superstar of world football.